Morris Architects, a Houston-based architecture and design firm, recently took top honors for two of their submissions in the Radical Innovation in Hospitality design competition. 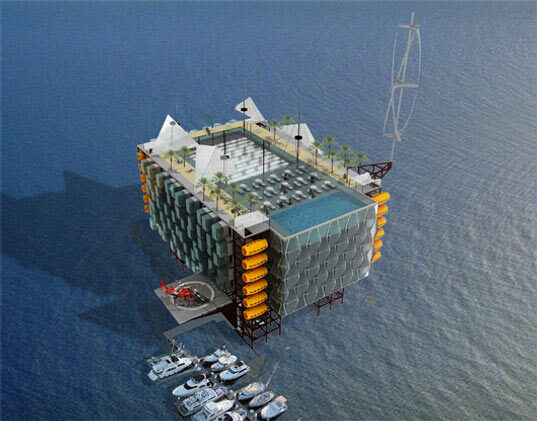 The grand prize winner, the Oil Rig Platform Resort and Spa makes use of one of 4,000 oil rigs out in the Gulf of Mexico and transforms it into a luxurious eco-resort and spa. We love how the inspired renovation takes an iconic source of dirty energy and converts it to an eco-haven that generates all of its power from renewable sources. This entry was posted on Thursday, February 19th, 2009 at 7:31 pm and is filed under design, tech., webfind. You can follow any responses to this entry through the RSS 2.0 feed. You can skip to the end and leave a response. Pinging is currently not allowed.